Robyns Simple Life: Death in the name of Electronics?!?! Death in the name of Electronics?!?! It saddened me to see the news report of the young man who was trampled to death in a Long Island Walmart yesterday on black Friday.. It also enraged me as well.. These people and I use that word lightly in this situation were so out of their minds that they literally banged down the doors right off their hinges and the young man who was only a temporary worker who happened to be standing behind that door was then knocked down and trampled to death all because these people wanted "good deals".. Is this what society has become? Is the answer to that is yes, then I want no part of it. What I can tell you is this is NOT Christmas. Black Friday is supposed to be a day where people can go shopping and get good deals on gifts for their loved ones for Christmas. We as a human race have gotten so FAR away from the meaning of Christmas is that is has become an absolutely disgusting ideal. Pope John Paul The Great as well as the current Pope, Pope Benedict the 16th have both warned that our society is and has become to materialistic and this senseless death yesterday proves their words ring true. There isn't even a way to justify what happened at that Long Island Walmart. Those weren't people they were savages. Greedy and Materialistic. For those of you reading my blog, PLEASE remember, Christmas is about CHRIST. JESUS CHRIST. Yes you read correctly. 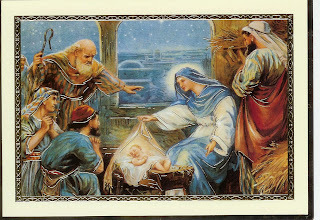 Christmas is the celebration of the birth of the Savior of all people all over the world. I don't care if you're not Christian or whatever your faith may be. THAT is what Christmas is. Another thing that burns me up as well is when I see people who refuse to believe in Jesus Christ, or even atheist who have the absolute GALL to celebrate Christmas. To them it's just another day to go out, spend money and have a party but there is one thing and the most IMPORTANT part that is ALWAYS forgotten. No one invites the guest of honor. Christmas is not about how much money you can spend, who can give the best gift to who. It IS about the birth of our Lord. So this Christmas instead of worrying about shopping at the last minute, robbing Peter to pay Paul just so you can buy those gifts, worrying about how much food and what you'll serve, instead, celebrate Jesus on his Birthday and invite him to the party!! AMEN! AMEN! And AMEN! How true! Christmas has become a secular holiday and it saddens me that a soul had to be trampled to death for those who were impatient and greedy to save a few shekels of silver. I believe that all who committed this MURDER should be punished to the fullest extent of the law and put in prison. This is simply unacceptable behavior. And to think that these individuals will be in church Christmas Eve knowing that due to their animalistic actions an entire family will be laying to rest an innocent soul. I am ashamed of those who killed. Numerous surveillance cameras are sold as sets. Ensure that any set you purchase has something like one night vision camera. There is a long and shocking history of that event, well before the approach of the electronic right and computerized right. It has most likely occurred since the times of the Gutenberg Press.